I find fermentation fascinating. I’m pretty much obsessed with it and wish I had discovered it earlier in my adult life (better late than never). I can’t really be too hard on myself though. In just a few generations, we’ve lost (most of) our food-growing and food-preparing skills. Fortunately slow, local, organic, real food has gained popularity and fermentation is enjoying a revival. My French-Canadian grandmother did not waste a thing. When my dad was little, she made blood pudding from pig’s blood, and head cheese from a whole pig’s head, which may sound totally revolting to most of us, but if you eat an animal, I think it’s best to use every part of it and I imagine these dishes taste pretty good (I’ve never tried them). I would be surprised if my grandmothers (who would be over 100-years-old today) didn’t ferment. It’s what cooks have done for thousands of years until Big Food stepped in to make cooking easier and our lives more convenient—and less healthy, less social and less pleasurable. Why should you ferment food? 1. Food preservation. A head of cabbage will rot in a week or so. Chop it, salt it and submerge it in its own juices for a few days and you’ll have sauerkraut, which keeps for many months (you’ll likely want to ferment it longer in order to benefit from more good microbes, but it will transform that quickly). Lactic acid bacteria (LAB), which occur naturally on all vegetables and increase after harvest, perform the fermentation. Bad bacteria cannot survive in a LAB fermentation. The undesirable guys get crowded out and die. Some people mistakenly believe fermented food may sicken them (or worse), but improper canning—not fermentation—has the potential to introduce botulism into food. Botulinum cannot survive in the acidic environment of a LAB ferment. Before the recent introductions of refrigeration and chemical preservatives last century and canning a century before that, people fermented or dehydrated food to preserve it. This was especially important in cold climates with short growing seasons. People could enjoy vegetables throughout the winter by fermenting them at the end of the summer. Cold weather slows down the fermentation, preserving the food longer, making this method a perfect, seasonal and natural fit in these parts of the world. 2. Health benefits. Fermentation pre-digests food (it’s actually controlled rotting) and this makes certain nutrients more available for absorption. Fermented vegetables contain higher levels of B vitamins, such as thiamin, riboflavin and niacin. Why did Captain James Cook bring barrels of sauerkraut on board his ships? Because fermentation helps preserve vitamin C, the lack of which causes scurvy. In addition to increasing and preserving nutrients, fermentation also reduces anti-nutrients. Phytates—present in grains, nuts, seeds and legumes—bind to minerals, making those nutrients unavailable for absorption. Fermentation breaks these bonds so the body can absorb the previously unavailable nutrients. And of course, microbes improve your gut flora. To learn more about the importance of a healthy gut, read Michael Pollan’s article in the New York Times. 3. Savings. My daughter loves Bubbie’s Pickles. These fermented cucumbers (as opposed to they typical shelf-steady pasteurized ones submerged in vinegar) taste delicious but cost a small fortune. Not that you shouldn’t buy them! If you don’t want to ferment cucumbers but want pickles, buy some like Bubbie’s! The company also sells delicious sauerkraut. I may have this wrong, I think a large jar of Bubbie’s sauerkraut costs about six or seven dollars. I can make a few jars of sauerkraut for about four dollars. I also preserve lemons, which cost quite a bit, if you can even find them in a grocery store. And crème fraîche? A small tub in my neck of the woods commands seven dollars. I have a quiche recipe that calls for three tubs. I make my crème fraîche with a cup of heavy cream and a quarter cup of cultured buttermilk. That costs less than three dollars and I have no plastic tub to deal with (I live plastic-free). 4. Low energy consumption, low-tech. Fermentation preserves food, enhances flavor and increases nutrition, all without consuming energy. I’m no fan of Big Oil, but Big Ag also plays a massive role in climate change and we hear less about that. Our current industrial food and farming system (according to some studies) generates 35 percent of CO2 emissions, while agricultural-driven deforestation generates another 20 percent. To me a jar of homemade sauerkraut isn’t just a tasty, healthy snack. It’s a protest of our current broken food system. An act of defiance. I’m not saying fermentation will save the world. But I do believe preparing food this way does put you more in tune with the natural world. The food is alive after all. Plus fermentation requires few tools—a knife for chopping and a jar for storing will suffice—and increases your self-sufficiency. 5. Kimchi. Kefir. Mead. Wine. Beer. Cider. Pickles. Salsa. Yogurt. Cheese. Sourdough breads. Ketchup. Chocolate. Coffee. Tea. Ginger beer. Cured meat. Vinegar. Vanilla extract. Kombucha. Soy sauce. Miso. Tempeh. Fermented food tastes good. You may also want to check out Sandor Katz’ website and his book, The Art of Fermentation, my fermentation bible (yet another religious reference). Most of the facts in this post come from this book. I want to try watermelon rind pickles! Just made my first batch of Watermelon pickles since 1979! Found my Watermelon had fermented, so instead of throwing it out I found I could eat the fermented melon, make wine out of it, and pickle the rind. I have done all of the above, plus when I did discover the melon fermenting it was sitting on an antique wood table! I was horrified thinking there goes that finish… not so. I quickly wiped it down, and several times with warm tap water after removing the fermented melon water, and found that there was no white marring of the finish. Instead, the wood is shiny, smooth, clear of any issues! Isn’t that amazing? Tap water would have ruined it! My different concoctions are now happily fermenting, and I am actually noticing more energy from eating/drinking the fermented melon, a lightness in my body. I am sure it is busy fixing all kinds of things inside of me, I had no idea this was good food going into a different form. How fun! Wow, you really used up every part of that watermelon! I’m glad to hear it didn’t ruin your table. There’s something magical about fermentation. My sister can’t eat store-bought pickles because they are made with vinegar and pasteurized–they hurt her teeth. But she can eat the fermented stuff with zero problems. Different people have told me the same thing–that eating fermented foods just energizes them, they can feel the difference in their bodies. I know eating this way has improved my health so much. I have never been this healthy in my life. Happy fermenting! we are big lovers of sauerkraut here thanks to my partner who is a great friend to all things of the fermented world. he also has tackled homemade sausages cheeses pickles of all persuasions and inspired three out of our four now grown up daughters to make their own sauerkraut . Wow, homemade sausages and cheese. Those are impressive. And delicious! What a great snack with the pickles. The meat section of my Sandor Katz book looks pretty intimidating. I haven’t actually read it yet. The only cheese I’ve made is ricotta, which is quick and easy. On my to-do list is mozzarella, but I have to figure out how to make that zero-waste. That’s wonderful most of your daughters are carrying on the tradition. Fermentation is a wonderful skill to have. Thanks for the comment. I’m definitely going to try the sauerkraut. I have a few of large head cabbages in the garden and we’ve been picking leaves cut-and-come style but I need to do something with them before they go over. 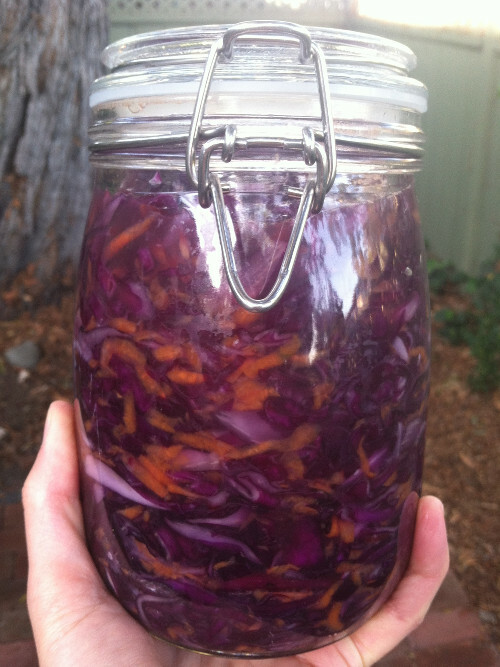 Fermented cabbage might be just the thing. Please do share a beetroot kvass recipe! I have enough roots in the garden to constitute a mini glut and would love to try to make some of that. I think your mother was right! I’ve never had offal but I’m a big fan of lard. The grocery store near me throws out pork fat (!) and I had been asking the guys at the butcher counter to save it for me, which they were happy to do, if not a bit confused/amused. I then rendered the tastiest lard or of it. And they never charged me for the pork fat (they have no idea what they’re throwing out and I’m sure will one day catch on). But they put the pork fat in a plastic bag and then wrap that up more in paper. It’s a lot of waste. So now I have this dilemma. Do I let part of an animal go to waste and forego the wonderful pork fat or do I throw out some plastic? I think it’s a little OCD of me to not ask for the pork fat. I could request ten pounds to lower the packaging to product ratio. What would you do? If you try the sauerkraut, just remember to keep the vegetables submerged. I have to reread/revise that post. I’m not sure if I stressed that or not. I sometimes place a couple of cabbage leaves over the top of the vegetables and then put a weight on that. I have a small ceramic dish that just fits inside some of my jars. I’ve heard of people using rocks too. And another thing, make sure you burp your jars. The CO2 builds up and you need to release that once a day. If you taste the kraut daily, you’ll do this anyway. And one more thing, put a plate or something under the jar as some liquid may bubble up and ooze out. I like red cabbage. It results in a beautiful purple-red sauerkraut. But you may not want your counters that color. With this also (and any ferment) try to keep the beet cubes submerged. I love this stuff. I bought golden beets this week and thought I would use them for a change of color. I hope you enjoy your ferments! Thanks for the fermentation tips! Good on you for asking the butcher to save the lard! Perhaps you can give him a labelled re-usable plastic box for that very purpose and when you pick it up at the end of the week, fortnight… hand him another. Rearing livestock is so land, resource and energy intense that it makes more sense to use every last bit of them. Furthermore, by using this fat you are avoiding unnecessary reliance on an energy, land and resource intensive corn and rapeseed industry. I know your having to weigh up the relative merits and evils of different industries and problems but I think the benefits of making use of a valuable waste product outweighs the plastic waste issue here. As I said in my ZWW Reflections and Perspectives piece, there will be dilemmas but I think the key is to conscientiously choose which resources we allow to flow through our lives. You’re welcome. I think you’ll enjoy making your sauerkraut and kvass. Great advice! I have been making vanilla and yogurt for years and two years ago I started making fermented pickled cucumbers, hot peppers, and okra. DELISH! I’m going to read about your buttermilk and try that next. thanks for all the great recipes and ideas! The best hot sauces are fermented. 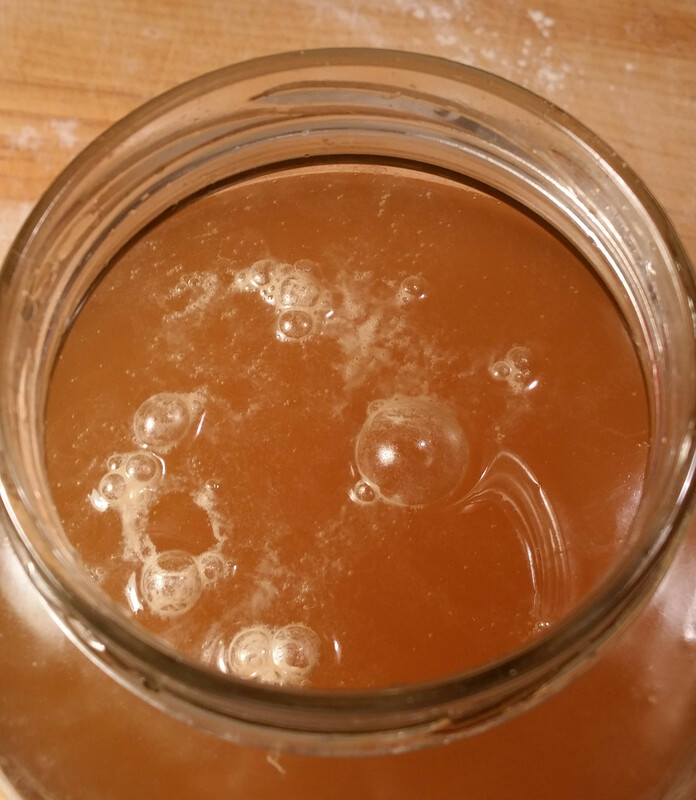 You don’t need to sell me on fermentation, but loved reading your post. Like you, I started doing this rather late in life, but one thing I noticed: so many of the things I really enjoyed in our travels I now realize were fermented – why didn’t anyone tell me? And by the way, I highly recommend blood sausage (aka black pudding) but make sure you get a good quality one. I have a great recipe for it, but it is terribly hard to get all the necessary ingredients at once – I keep trying though. I didn’t realize either until recently that all the good stuff is fermented. Do you buy blood sausage/blood pudding at a specialty shop? It doesn’t sound like the kind of thing a typical grocery store would carry. I hope you’re able to find ingredients for it. I would love to see (read about) how it’s done. I have a friend, an older woman on an extremely limited budget, who ferments all the scraps of vegetables from cooking. This allows her to afford vegetables, and she wastes nothing. I’m always amazed that fermenting isn’t generally included on the eat-well-for-little circuit! Ohhhh, that’s such a good idea. I save my vegetable scraps in the freezer and when I have enough of them, I make broth, but I love the idea of fermenting them instead. That’s more nutritious, more filling and even more frugal. I too am amazed I don’t find more information about fermenting as a way to eat well for little. I think people just don’t know anything about it or they think it’s dangerous. I had to scroll back to the top photo and you made me laugh out loud again. I know you love those books too. In fact, that setup is more a picture of a shrine than of a kitchen table with books and food. I didn’t realize blood pudding was native to so many European and Asian cultures. Koreans love it – delish. Consuming the whole animal provides a better balance of energy. So you like kimchee? =) Great post. Thank you 🙂 Kimchi is delicious! I’ll have to do a post on it…I haven’t had blood pudding but I would like to try it. I can probably find some around here.